There is no immediate parking available in Back Lane West, but there is a public Car Park called 'Fair Meadow' right next door, accessible from Station Hill. 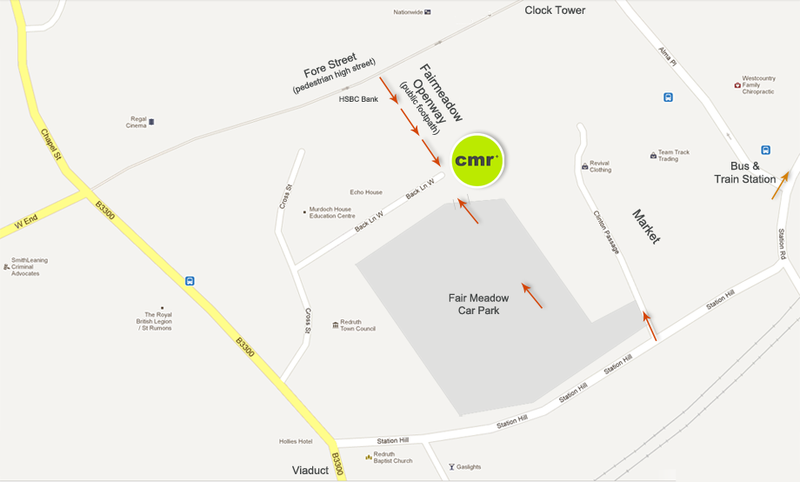 You can walk straight through a small gateway from the car park to the front of CMR. Redruth is next to the main A30 road and thus has access to the main route in and out of Cornwall as well as routes to the far West, North Cornwall, South East Cornwall and Plymouth. CMR is very close to Redruth railway station, served by trains from London Paddington, the Midlands and the North to Penzance. The nearest airport is Newquay, which is about 16 miles away.